Julie Pissarro, Paris (by descent from the above, 1904). Lucien Pissarro, London (gift from the above, 1921). Esther Pissarro, London (by descent from the above, 1944). Wildenstein & Co., Ltd., London (acquired from the above, 1946). Wildenstein & Co., Inc., New York (acquired from the above, 1959). Acquired from the above by the family of the late owner, 1962. F. Rutter, "The Galleries, Camille Pissarro and The London Group," The Sunday Times, 16 May 1920, p. 5. "Camille Pissarro, Memorial Exhibition," The Morning Post, 21 May 1920, p. 4. F. Rutter, "Camille Pissarro," Arts Gazette, 22 May 1920, p. 76. L.R. Pissarro and L. Venturi, Camille Pissarro, Son art, son oeuvre, Paris, 1939, vol. I, p. 95, no. 112 (illustrated, vol. II, pl. 22; titled Etude à Lower Norwood). C. Kunstler, Pissarro, Cities and Landscapes, New York, 1967, p. 13 (illustrated in color, pl. 5; titled Lower Norwood, London). C. Lloyd, ed., Studies on Camille Pissarro, London, 1986, p. 55 (titled Etude à Lower Norwood). N. Reed, Camille Pissarro at the Crystal Palace, London, 1987, p. 18, no. 22 (illustrated in color, p. 53). J. Pissarro and C. Durand-Ruel Snollaerts, Pissarro, Catalogue critique des peintures, Paris, 2005, vol. II, pp. 166-167, no. 193 (illustrated in color, p. 166). Paris, Galerie Eugène Blot, Camille Pissarro, May-June 1907, no. 2. Paris, Galerie Manzi-Joyant, Exposition rétrospective d'oeuvres de Camille Pissarro, January-February 1914, no. 84. London, The Leicester Galleries (Ernest Brown & Phillips), Memorial Exhibition of the Works of Camille Pissarro, May 1920, p. 19, no. 53. London, The Leicester Galleries (Ernest Brown & Phillips), Three Generations of Pissarro, Camille, Lucien, Orovida, June 1943, p. 11, no. 65 (titled Etude à Lower Norwood). London, Matthiesen Gallery, A Camille Pissarro Exhibition, June-July 1950, p. 3, no. 4 (titled Etude à Lower Norwood and dated 1870). The Art Institute of Chicago, Chicago Collectors, September-October 1963, p. 48 (illustrated, pl. 37; titled Lower Norwood and dated 1870). New York, Wildenstein & Co., Inc., C. Pissarro, March-May 1965, no. 6 (illustrated; titled Lower Norwood). London, Barbican Art Gallery, The Image of London, Views by Travellers and Emigrés, 1550-1920, August-October 1987, p. 60, no. 174 (titled Study at Lower Norwood). The Baltimore Museum of Art; Milwaukee Art Museum and Memphis Brooks Museum of Art, Pissarro, Creating the Impressionist Landscape, February 2007-January 2008, p. 124, no. 22 (illustrated in color, p. 125). Pissarro and his family sailed to England in December 1870 to escape the turmoil of the Franco-Prussian War. There they rented a small house in Upper Norwood. His friend Claude Monet had also taken refuge in England and was living in nearby Kensington. Pissarro and Monet visited museums together and both were particularly impressed with J.M.W. Turner and John Constable. Between December 1870 and mid-June 1871 Pissarro painted fourteen oils of scenes in and around Upper and Lower Norwood. South Norwood, étude is probably one of the last works Pissarro painted during this first stay in England. Likely painted from a spot on Mowbray Road, in the view of art historian Nicholas Reed, the building in the background can be identified as the central block of the Victorian-style Orchard Lodge, which was part of the North Surrey Industrial Schools. The three oddly shaped chimneys were the tops of heating ventilators. The spire on the right is that of the Holy Trinity church on Croydon Road. The long white line at the right of the painting could be mist rising from Norwood Lake. A curving road meanders deep into the composition to a vanishing point at the center of the horizon. The blues, greens and browns are broken only by the stroke of orange brown of the cow on the right of the composition. Pissarro likely learned the technique of adding a dab of red or orange to draw the viewer's eye into the painting from the Barbizon works of Jean-Baptiste-Camille Corot and Gustave Courbet. This bucolic scene not far from the famous Crystal Palace no longer exists. The Crystal Palace turned Norwood into a fashionable suburb of London, bringing with it urban development. 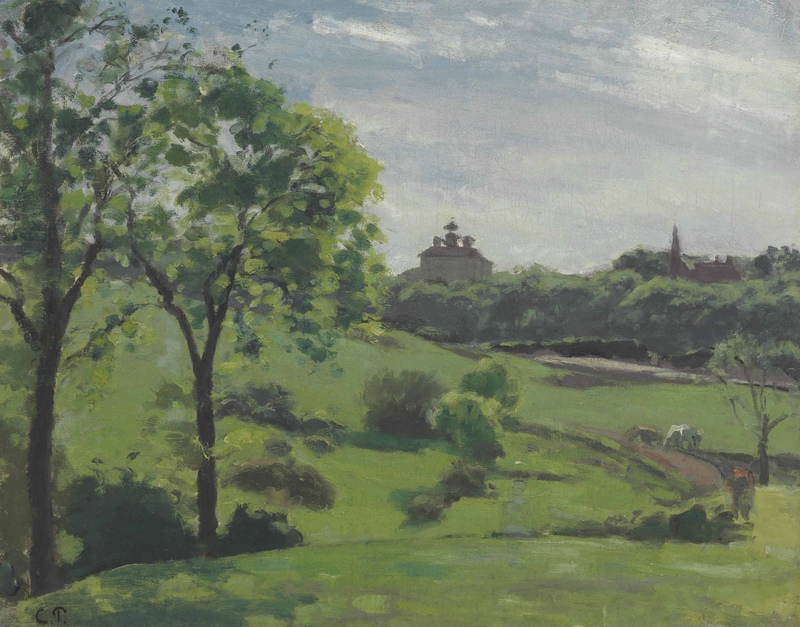 Pissarro's friend, the dealer Alphonse Portier, requested South Norwood, étude in lieu of cash payment for his services: "Among the paintings I cleaned for you, there is one that I wouldn't mind having for myself...It's the one depicting the church at Norwood." (quoted in J. Pissarro and C. Durand-Ruel Snollaerts, op. cit.). Unfortunately for Portier, Pissarro was attached to this work and kept it in his personal collection. He was not alone. Cézanne so admired Pissarro's works of the 1870s he once remarked, "Had Pissarro continued to paint as he did in the 1870s, he would have been the master of us all" (quoted in N. Reed Camille Pissarro at Crystal Palace, London, 1993, p. 2).